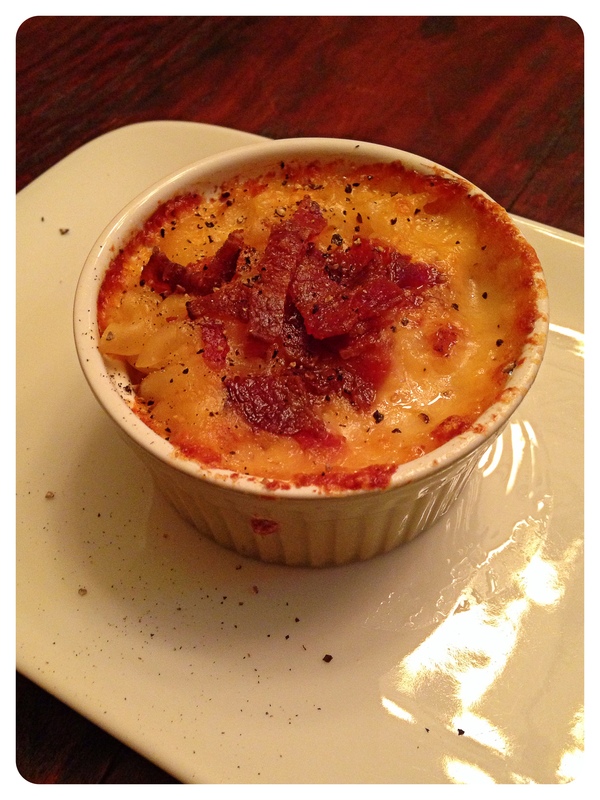 Beer and Bacon Mac and Cheese | Kitchenpants! In a scene from one of my favorite movies, Say Anything, Lloyd Dobbler gets up the courage to call Diane Court and ask her for a date (or a scam or whatever) and when she resists, he asks her if she’s “monumentally busy”. Of course, this breaks her down and they get together and before you know it, he’s pointing out broken glass to her and they’re in love and on a plane to England while her father serves out a prison term. Of late, the term “monumentally busy” is pretty much a summary of my life. And I think I complained about this a few posts ago and honestly, nothing bothers me more than people who complain about how busy they are so I am essentially becoming the kind of whiny, time-mismanaged person that I normally can’t stand. Good thing there’s comfort food like Mac and Cheese for occasions like this. This recipe makes a large batch, so feel free to cut it in half if you want…or if you’re making it for a party like I was, you can make the whole recipe and then heat one of the dishes in the oven immediately, and save the other in the fridge for the next day and heat it in the oven then. Despite being homemade, this recipe doesn’t take long to make – which is fabulous for busy people like me (Ack! Ack! I know. I’m just going to own it.). This is for a large portion that will serve 10-15 as a side or 8-10 as a main dish. 12 oz. Beer – Use a good one! I have made this with Revolver Blood and Honey and Shiner White Wing. These are local to Texas, but any good Ale will do. Blue Moon would be a nice choice here. Try to have the beer at room temperature if possible. Bake the Bacon: Pre-heat the oven to 400 degrees. Lay the uncooked bacon on the foil-lined pan and bake in the oven until crisp – about 15 minutes or so. Remove and drain on your paper towel-covered plate. Set aside. Melt the butter in the medium sauce pan over medium-high heat and add the onions (you may elect to use shallots here as well if you prefer). Stir the onions around for a few minutes until they become translucent. Make a roux: Add the flour to the pan and whisk it around until it’s a golden color. 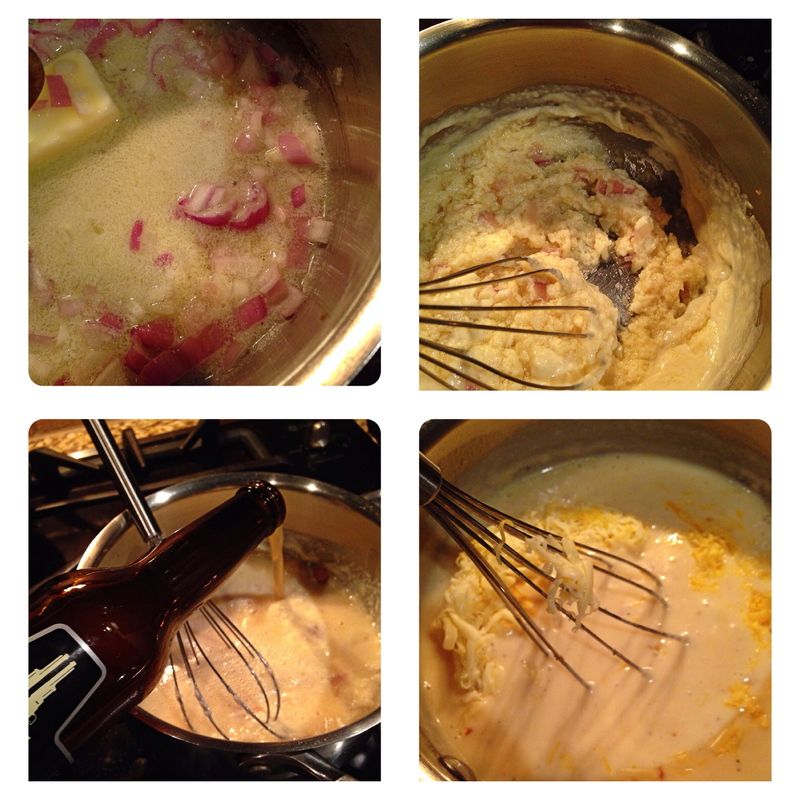 Slowly mix in the cream or half and half and then add the beer slowly as well. Use the wooden spoon to blend. Whisk in the cheese a little bit at a time. Once you have added the last of the cheese, keep whisking until everything is blended. Let the cheese sauce heat over medium heat for another 5 minutes or so stirring occasionally. While the sauce is heating, fill your pasta pot with water, bring it to a boil and begin to cook your pasta. Taste the sauce and add salt, and black and white peppers to your taste. Set the sauce aside. You can keep it warm on a simmer setting. Keep stirring it. Drain the pasta when its ready (do not rinse!) and pour a portion of it into your casserole. Add a bit of cheese sauce over the pasta (if the sauce has cooled, it might thicken up a bit. Reheat it and add a little milk or cream to it to smooth it out). Continue layering pasta and cheese until you have filled both pans. You will likely have some cheese sauce left over. Crumble the bacon bits over the top along with crumbles of quick garlic croutons. Bake in the oven uncovered at 350 degrees for 30-35 minutes or until heated through and bubbly. Remove from the over and sprinkle with a bit of black pepper. PS. Hungry for more sass? Find me at the Fort Worth Moms Blog.